About a year ago right now, I was just beginning a six-month stretch of what would produce the best golf of my life. Great courses. Career rounds. Shot after shot that I still see in my dreams, and putts that found the hole more often than not. I experienced it all. A year later? Not so much. My opportunities to golf are still great, but my ability to take advantage of them and play golf at a high level is not. My alibi for the state of my game is something I’ve come to term “the Golf Academy hangover.” It’s what happens when you don’t hit 100 practice balls a day and get to see yourself on video as I did for my two semesters attending the academy. To try to rediscover my old game, I finally called on my former mentor, Mike Flanagan, this week to look at my swing. Another instructor started the crafting of my new swing at school, but Flanagan, as he does for many, finished it. And, sure enough, within 15 minutes at the range on Tuesday, he had me hitting balls like my old self. Besides helping me recapture a little lost joy for the game, the whole experienced reminded me what I miss most about school: the lessons. I used to have one every week, sometimes two. Those were the moments where the magic happened. In those 20-30 minutes, you got a glimpse of what you were capable of and what your instructors knew, and you learned how good they were at relaying it. In that regard, every lesson was two lessons in one – if you were really paying attention – because this is what the school was supposed to be training you to do someday. I’ve written a little on the blog about some of my lesson experiences in school, but I literally could probably sit here and pound out posts for hours recalling certain great teaching moments. Those moments were what school was all about for me. They were much more fun than the tournaments or even the open rounds with friends. My lessons with Flanagan in particular were a joy as I not only routinely got better, but I would take it to the course that afternoon and have immediate results. As anyone who has taken lessons knows, that’s not always the case. But with Flanagan it was. And if I couldn’t play that day, I’d at least go to the range and enjoy what new gift my swing had been given that day. For those who don’t know him, Mike Flanagan is the senior-most instructor at the Golf Academy and a revered figure in San Diego teaching circles. He’s a bit like the Obi Wan-Kenobi/Yoda/Mr. 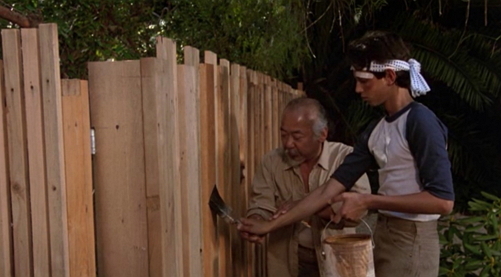 Miyagi – chose your sage movie mentor – of the school. You know when go to see Flanagan you’re going to get one thing about your swing – the truth. Students at the school will tell you that if you’re not ready to hear that about your swing, you’re not ready for him to teach you. But eventually you look forward to hearing the truth – as I did Tuesday – and know it’s the fastest way to improvement. It’s like agreeing with the doctor on the diagnosis so you can move on to the treatment that will give you the cure. The truth with Flanagan arrives straightforward and usually quickly, after just a few swings. On Tuesday, I was describing the recent failed experiment with changing my grip and some other mechanical faults – things I never worried about, by the way, when I was playing well – when Flanagan hit me with truth. And sure enough, within a few swings, my hook was gone and I was dropping balls next to the 150-yard mark Flanagan had told me to focus on. It wasn’t quite magic, but it was a start. The magic would come next. Flanagan got inside my grip and changed the two things – the placement of my left pinkie and left thumb – that had been causing me to close the club face. After a few swings to get comfortable, I was making flush contact again and flying the 150 sign with my 7 -iron as I would’ve in my prime of last year. He then taught me a method for “feeling” that grip every time and before every swing so I can easily replicate it. And like that, I had my old grip back. Of course, there was more work to be done, but that was the start. The relationship of the club face to the ball is the most important element of the golf swing. Praise with Flanagan is never effusive, but it’s there. And it sometimes arrives as a back-handed compliment, as it did Tuesday. “I don’t care that you’re over the line, past parallel and your left arm is breaking down a bit; we both know you can that club face back to square and hit good golf shots,” he said. For the rest of the lesson, we mostly worked on tempo and regaining the pause in my backswing so I could load properly for the forward swing. And soon I was effortlessly flying balls to the back of the range. And effortless, by the way, is what the best golf feels like, and my swing had become anything but. Tortured and laborious would be just a few words to describe what I had been doing through. The bigger gifts of my lesson on Tuesday were hope and confidence that I can play the game again the way I used to. That might take few more lessons and little more practice, but it’s worth it to experience the game that way again. And that’s also something that I wish more golfers could experience. For all that we’re told ails the game (cost, time, pace, etc. ), the elephant in the room is that many people don’t play very well. All the evidence of that you need is a walk to your local driving range. You’ll such much more wrong that right. And it doesn’t have to be that way. I wish the barriers (money, time, etc.) to people taking lessons were less so people would enjoy the game more. Because thinking you’ll figure this stuff out on your own, for most of us, is like trying to perform your own brain surgery or build your own car – it just isn’t happening. The swing is too complicated and too technical and, as my experience shows, too tough to self-police to figure it all out on your own. Training aids, golf magazines, YouTube and all that can help you a little, but without a foundation in the fundaments you won’t get very far. But beyond just playing better, lessons are fun, especially once the frustration of the struggle and the self-imposed pressure to perform are removed. And once you get to a certain stage in life, how many things are you still being taught to do? Unless you’ve signed up for a cooking class or personally training, chances are not much. And if you’re a parent, you’re likely the one doing the teaching now. My most teachable role has been as an editor. I consider one of my abilities as a writer the ability to teach it to others. I’ve helped numerous people, especially those who didn’t think they could write or write well, do this. I think that’s a gift. Moreover, I not only can help you write, I can help you write like you, which not everyone can do. Others can make you write like them, the equivalent of a method teacher in golf. That’s not Flanagan. He makes you swing like you. And moreover, a better you than you maybe imagined. We’ll start finding out today whether I can take it to the course, but I’ll at last tee it up with the belief that I can and a plan. And’s more than I had before Tuesday. This entry was tagged Golf Academy of America, golf lessons, Mike Flanagan, Mr. Miyagi, Yoda. Bookmark the permalink.